Market planning doesn’t have to be a chore. With Geosearch you can find trade areas that match your brand’s criteria in seconds. Thank you! We'll email you with updates as they become available. You can use trade area size, demographics, points of interest, and traffic volumes as site criteria. With Geosearch you don’t have to waste time building trade areas and exporting complex reports. Just click any highlighted block on the map to see how it compares to your site criteria, based off your custom trade area. We have pre-processed the demographic data for each of our trade areas at every possible site in North America, allowing us to quickly determine whether a block matches your site criteria. How is this different from the existing PiinPoint platform? Geosearch is a standalone tool that integrates with the existing PiinPoint platform. 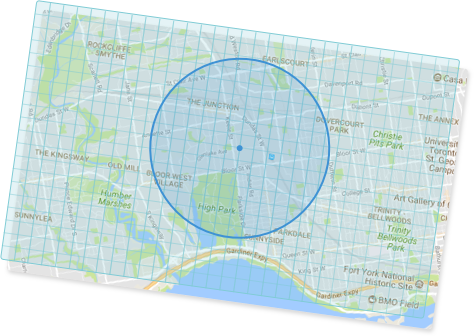 Unlike our traditional target market heatmap, Geosearch returns results based on trade areas, not just block groups, giving you a more accurate depiction of whether a site is suitable for your unique brand. Geosearch also allows you to evaluate sites based on demographics, points of interest and traffic at the same time, giving you a more streamlined market planning workflow. I'm already a PiinPoint customer. How will Geosearch fit into my workflow? Geosearch can be used in combination with the existing PiinPoint platform. Starting with Geosearch, you can identify trade areas that match your site criteria. Those trade areas can be saved as shapes in the existing PiinPoint platform, allowing you to see how it overlaps with your current store trade areas, your customers, and build reports with additional demographics and POI data. When will Geosearch be available? We are working hard to release Geosearch in Canada and the United States as soon as we can. Sign up to our Geosearch mailing list to get updates as they become available. How much will Geosearch cost? We will release more details about this soon. Sign up to our Geosearch mailing list to get updates as they become available.